My family and I like to collect the mystery CMFs sets that are released roughly three times each year. The mini-posters are placed in consecutive order on a wall in the kitchen for all to look at, and the kids get to pick a newer CMF as a reward for their school performance. There's really no surprise that Series 1 is King of the CMFs; however, I was surprised by Grandpa making the list (no disrespect to you Grandpas out there). I guess it might be a good time to pick up grandpas and grandmas before they go higher. 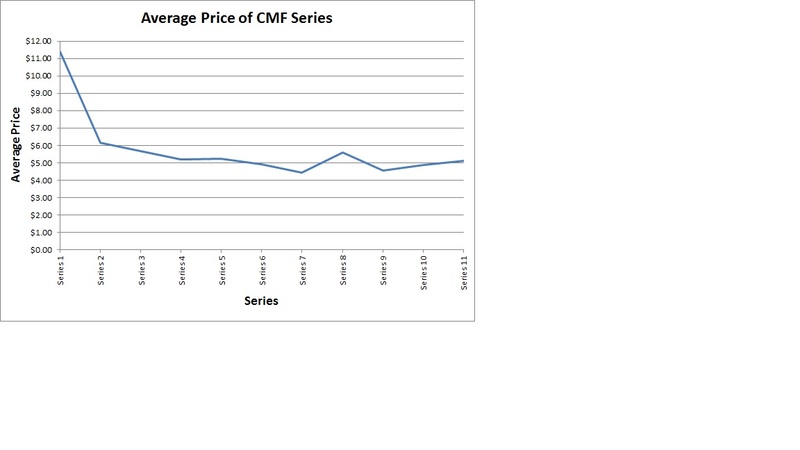 The highest average priced Series CMF is Series 1 (as is obvious), and the lowest average priced Series CMF is Series 7. Keep in mind that Series 1 and Series 2 CMFs sold for $1.99 while all future Series CMFs sold for $2.99 (unless you were unfortunate enough to purchase yours at TRU...then suffice to say it was likely higher than $2.99). The attached graph shows the average current prices in the USA for each series. I will be glad to produce more statistical info as requested regarding the CMFs as time allows. I actually would have thought the cheerleader and skateboarder would both be higher on the list, but both are included in the Lego calendar; hence, they are both easy to get. I would image sealed versions of either are higher though. I'm not sure about the caveman...would have thought he would have been higher too, but the data is what the data is. Conversely, the deep sea diver used to be much lower, but appears to be moving up. Bricklink might give you more reliable data, and over six months too. You'll notice quite different results. Thanks for the link...I'll check it out. I have found that CMFs purchased on Bricklink tend to be more expensive than eBay for me...at least with new sealed CMFs. Because of this I'll check Bricklink, but tend to end up just purchasing from eBay. I've just collected them all CMF Series 1-13, and I've been tracking them with a spreadsheet. I find series 8 and 10 were the most expensive generally after series 1-3. We've recently started collecting the CMFs and have found eBay prices to be cheaper than Bricklink. We also earn eBay bucks with each purchase (very minimal, maybe a few dollars at most), which helps toward a future purchase. We've found series 8 to be unexpectedly expensive (assuming that the older the series, the more expensive the set). To me, they are all getting expensive, even at retail. The lowest price I see now is $3.99, some Targets in California have them at $4.99. With the exception of the first two series, as the primary market takes a hit, I'd expect to see the secondary market drop way off, too. Except for Mr. Gold of course. I know he doesn't count. I frankly wish he didn't exist. ^Mr. Gold is the reason Lego counterfeiters exist.